– the research and development of the large aircraft engines. With the fast development of China’s aviation manufacturing industry, the demand for aeronautical materials and processing equipments is growing fast. Statistics show that, in the next 10 years, China’s aviation materials market and the related processing equipment overall market scale will reach 120 billion RMB. By 2020, the Chinese civil aircraft industry revenue will exceed 100 billion RMB. 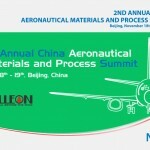 Officially organized by China Society of Aeronautics and Astronautics, hosted by Galleon (Shanghai) Consulting Co., Ltd., a partner of the Italian Aerospace Network, the 2nd annual China Aeronautical Materials and Process Summit will be held in Beijing from November 18th to 19th 2014.